I woke Christmas morning two hours after I had planned to leave for the day, in some else’s bed, in the middle of an orthodox neighborhood in the outskirts of Jerusalem. Yes. That Jerusalem. After nearly three years travel during the holidays, this was both the highest and lowest of my experiences. On one hand, I was in what many considered to be the holiest place on earth. Yet, as I stared up at the ceiling, I couldn’t help but wonder if it was best just to stay in bed. There was in a terrible pain in my back that was so intense I could barely move. The most likely cause was that I had pulled a muscle while carrying my suitcase up the four flights of stairs to my Airbnb. But as much pain as I was in, I wasn’t going to let that stop me. As a former devout Christian, I was determined to make it to Bethlehem for what is sure to be a once and a lifetime experience. What remained of my faith wouldn’t allow me to stay inside. My research had told me that the journey to Bethlehem started with a short bus ride from old Jerusalem. Luckily for me, my accommodations were located mere feet from the tram that would take me into the old city. Even better was that there was also a pharmacy on the way; one that I planned to hop into so that I could pick up a pain killer. It was the only way that I’d be able to manage throughout the day. As I finally made my way outside, I had to keep reminding myself that it was actually Christmas Day. This was by far the least Christmasy place I had ever been to. By contrast, I had spent nearly every year before wandering Christmas markets and attending church services in ancient Cathedrals in central Europe. But as I watched the people around me move about seemingly unaware of the magnitude this day holds across the world, I knew that that wouldn’t be the case here. 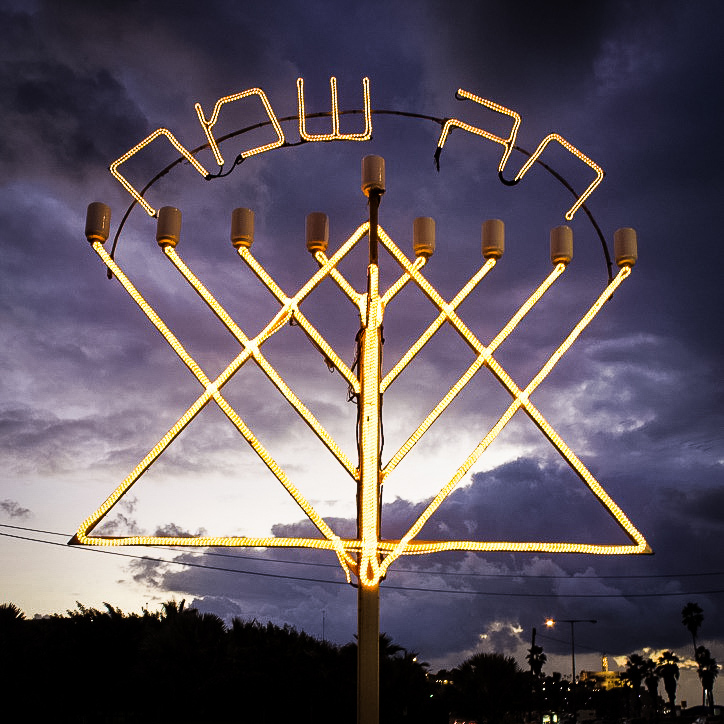 To be fair, Israel wasn’t a completely anti-Christmas zone. 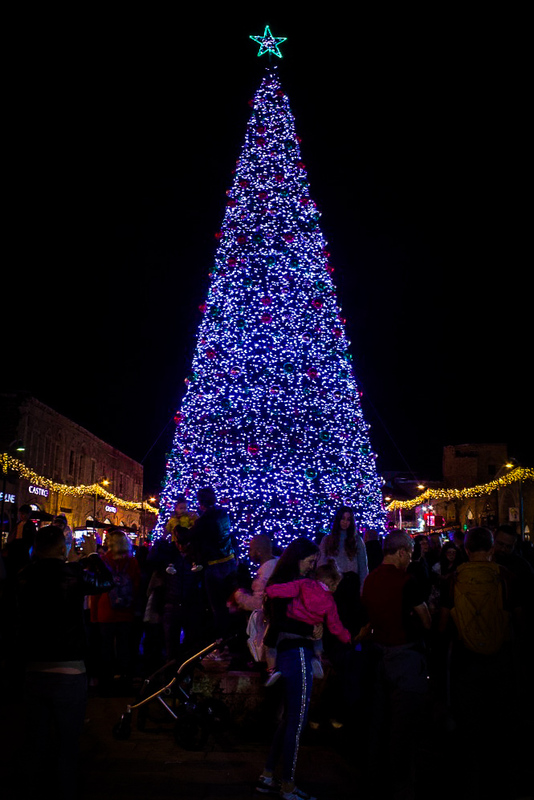 There was a Christmas tree in old Jaffa in Tel Aviv, located just a few yards from the giant Menorah. It seemed that people from every persuasion and walk of life wanted a picture in front of the tree. As the month wound down, the crowd grew larger, making it even more difficult to get the perfect Instagram picture. But that didn’t keep them from trying. Back in Jerusalem, I hopped on the tram and made my way to the old city. As I arrived at my stop, my GPS conked out. Luckily, the bus stop was located directly behind the tram. I hopped on and made my way to Bethlehem. It was a short ride into Palestine. It wasn’t my first time crossing the border, but it was the first time that I was doing so alone. As the bus was coming from Israel, it did not need to stop at the check point. However, the quick pass-through did little to quell the uneasiness that I always feel when passing from one side to the other. And driving past the huge red sign warning that entry into Palestine was effectively driving into certain death certainly didn’t help either. As we drove along and the bus pulled into Bethlehem, I couldn’t help but feel slightly overwhelmed. Though I certainly wasn’t taking the route that Mary and Joseph did, a bus was a huge upgrade over a donkey, I did feel as though I was tracing the steps of history. And at the end of it, I had one goal and one goal only—to visit the manger where Jesus was born. However, as I was still without wifi, I had no way of knowing exactly where that was. And as a millennial, of course I hadn’t thought to bring a map. This worked to my detriment of course, because as soon as I stepped off the bus I was accosted by men offering to provide me with tours. But luckily for me, I had one thing to light my way to the manager. No, it was not a star. It was the collective of white people who were all walking in the same direction. I decided to ignore the tour guides and follow behind all the other foreigners up the hill to the Plaza of the Nativity. As I walked through the winding streets past all the shops and venders, I felt for the first time that I was truly in the Middle East. The streets of Bethlehem were strikingly similar to the back streets of Istanbul. In contrast to the relative peaceful atmosphere of Tel Aviv, Bethlehem was bustling and busy—as full of history as it was of bodies. And on this day, it seemed as if the entire known world had decided that this was the place to be. Everyone hoping to soak up the magic cast that day on the alleged site of the virgin birth over 2000 years ago. Once I had made it to the front of the crowd, I did something I rarely do. I took a picture (of myself) in front of the tree and nativity scene. And just like the one in Tel Aviv, people from every walk of life were posed in front of the tree eager to take a picture. Among them was a mother in a hijab who attempted to place a Santa hat on her daughter’s head. The attempt was futile, as her daughter tore the hat off in a fit of teenage embarrassment. But the temper tantrum did little to temper the mother’s joy. Suffice it to say it was a surprising scene. One the melted many of the prejudices and ignorance that I had previously held between Islam and Christianity. I had hoped that I would be able to attend a church service inside the church of the Nativity, but to my surprise, the entrance was no where to be found. So instead, I followed the crowds to a place I had never even heard of—the milk grotto. According to legend, this is the cave where Mary allegedly first feed the baby Jesus, hence the name. While I took many pictures, nothing could capture the beauty of this place. It is, bar none, one of the most beautiful Christian sites that I have ever visited. After emerging from the grotto, I spent a bit more time wandering down the hill trying to find the entrance to the church of Nativity. Finally, it dawned on me to walk to the other side of the church. And there I found a small hole in the side wall. It seemed less like a church entrance and more like a cave. But people were going inside, so I decided to follow. I know now that this is called the Door of Humility built by the Ottomans to prevent looters and carts from decimating the Holy Site. However, once I stepped through the door I knew that this had to be it. From wall to ceiling, there were mosaics. Beautiful, intricate mosaics detailing, well, I wasn’t sure exactly. I just knew that it was large, somewhat resembled a tree and had a lot of faces on it. A bit of research once I got home told me that it was a depiction of the genealogy of Jesus Christ. Although I was inside the church, I knew that this wasn’t the site of the manager. There was nothing there depicting the Nativity and there was a huge line of people lined up in front of a door on the far right side of the church. And it seemed as though there were as many people inside the church as there were tiles. The line snaked around at least three times with that door on one end and a group of Spanish priests standing on the other end. I learned through osmosis that at the other end was the entrance to the flight of stairs that led down into the old manger. I stood in line for nearly an hour, fanning off interlopers who, despite the setting, seemed to have no problem cutting in front of me in. After an hour, the gaggle of priests in front of me took off, agreeing to come again another day. I stayed for another 30 minutes before the Greek Orthodox priest appeared and told us that church was closed for a service. And since I clearly wasn’t Greek Orthodox, I was not allowed to stay. I was mildly disappointed, but I vowed to come back another day when I had allotted myself more time. After a quick trip to the bathroom to re-up on painkillers, I stopped for a falafel before heading back to the bus. Once I was back in the Airbnb, I heated up my dinner and decided against my tradition of watching Love Actually. Instead, I chose to dive deep into a bit of nostalgia and watch the Preacher’s Wife—one of the few mainstream Christmas movies that featured people of color. It was a bittersweet experience. While this wasn’t my fist time spending Christmas night alone, it was the first time that I had done so while feeling this lonely and isolated. When it was time for bed, I turned on the heating pad and tucked into someone else’s sheets. As I stared at the ceiling with the pain in my back slowly throbbing, I vowed that I would never spend another Christmas in a place where people didn’t believe in Christ. Although I didn’t either anymore, there was still something to be said about being surrounded by those who did. There was a sense of magic and community that I just didn’t feel in this corner of Jerusalem. And so as I closed my eyes for the night, I gave a prayer of thanks to no one in particular for having the opportunity to even have this experience. Because I was never going to repeat it again. Then I closed my eyes and slept.